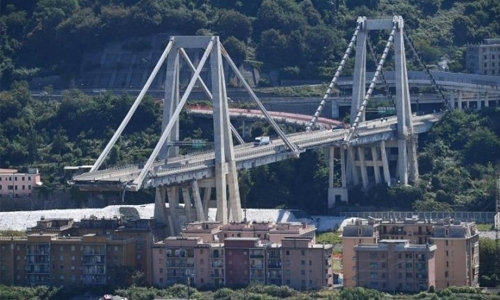 Engineers started the delicate task of taking apart Genoa’s Morandi motorway bridge yesterday almost six months after its partial collapse during a storm killed 43 people and injured dozens. Thousands of tonnes of steel, concrete and asphalt have already been removed from the spectacularly truncated highrise bridge in the northern Italian port city to make it lighter before the “deconstruction” operation began. “It’s an important day, the first step on a path that we hope will be as short as possible,” Prime Minister Giussepe Conte told journalists at the site. Four powerful strand-jacks positioned on the bridge by an enormous crane began unhooking and slowly lowering a 36-by-18 metre (118-by-59 foot) concrete slab weighing over 900 tonnes. The jacks are the same as those used to right the Costa Concordia cruise liner off Tuscany in 2013, after it ran aground and capsized with the loss of 32 lives. The operation to lower the vast slab around 48 metres to the ground is expected to take at least eight hours. The operation will help the city move on from the August disaster, which beyond the human cost also ripped out one of the city’s main transport arteries. Italy’s most famous living architect Renzo Piano, a Genoa native who helped design the Pompidou Centre in Paris, has provided the design for the replacement bridge that “will last for 1,000 years”. While the new structure has been designed to look different from the old one, opened in 1967, it will contain a homage to the victims of the accident. It will feature 43 lamp poles in memory of those killed when a section collapsed during a storm on August 14, sending dozens of vehicles and tonnes of concrete tumbling to the ground. The new bridge commission, headed by Genoa Mayor Marco Bucci, noted the new design “rests on pillars, respecting the feeling of psychological aversion in the city (to) other types of bridge with suspended or cable-stayed parts”. It will “have elements of a boat because that is something from Genoa,” Piano has said, describing a streamlined and luminous white structure. The new bridge is estimated to cost 202 million euros (US$229 million), making it one of the most expensive in Europe. It is expected to be open to traffic by April 2020, junior transport minister Edoardo Rizi said on Thursday, with the demolition of the old structure due to take 190 days. The old cable-stayed bridge was made from reinforced concrete, with the steel cables linking the bridge’s towers also covered in concrete. One theory investigators are looking into is that the steel within the concrete had decayed, although this would not have been visible. There have also been allegations of poor maintenance, poor design and questionable building practices. Explosives will be used to demolish the bridge from around February 20, Genoa’s Repubblica newspaper reported. The eastern side of the bridge, where the structure gave way, still needs to be examined by experts and prosectors. Autostrade per l’Italia (Aspi) operated the failed bridge and several of its managers could face trial over the collapse. Ahead of anticipated court proceedings, Aspi is still negotiating compensation payments with bereaved relatives, for a total of 50 million euros.